Reviews | Regal Thyme Leaves - 32 oz. Regal Thyme Leaves - 32 oz. Enhance your slow-cooking recipes with Regal thyme leaves! A green, perennial herb from the mint family, thyme adds fresh flavors to sauces, braises, and roasted items. Use these dried thyme leaves to lift the aroma of stocks, stews, and soups. Thyme's strong aroma makes it ideal for slow-cooking recipes that will soak in and absorb its flavor. I love getting all my spices from Webstaurant. They come super fast, save me a trip to a restaurant supply store, and they save me a ton. I will never get my spices from anywhere else now. I use a lot of thyme and I couldn’t have asked for a better dried thyme than this. Great flavor and buying it in bulk was the right choice. The regal thyme leaves are great and are amazing for seasoning chicken or any meat. The flavor is perfect and very potent. The leaves are a great quality and not dusty like with some other brands. Nice quality. Regal Thyme Leaves - 32 oz. is an outstanding, high quality product. The price is very competitive. I will continue to use this product in the future. This is a pretty standard Time leaves dried. Large size container but you've been using for years. The neat thing about this is the unique shaker top that I have actually never seen before. Ordered Thyme leaves to go into a BBQ Sauce that we were making and it was definitely worth it. The flavor that was delivered from using this was outstanding. Will purchase this again. Great "whole" thyme product. Not too finely ground, this is a more coarse thyme product. We enjoy using this to season poultry dishes, soups, and sauces. These leaves are great way to quickly flavor in stuffing, soups and as a perfect addition to as croutons. I have had these containers last in freshness over a year, as long as you are gentle with the container. All of these spices, including this thyme, from Regal cannot be beat! They are of equal or better quality that most of the private labels, or national brands, and are only a fraction of the price. The regal thyme leaves are awesome and save us the hassle of cleaning and prepping fresh thyme for our chicken thighs. The leaves are aromatic and really compliment poultry well. Thyme leaves are great for cooking. They add a great herbal sweetness to our dishes. Great color and really nice quality dried leaves from Regal. The Regal Thyme leaves are great for adding a nice herbal touch to our meats. A great way to kick up the flavor of smoked and grilled lamb. A great spice to keep in stock for our cooking. The thyme leaves arrived fresh and very good quality with little crushed leaves. A great seasoning for our grilled chicken. The Regal Thyme leaves are such a great quality and are very coarse. Some brands are just green dust. I love the whole leaves and they make a great seasoning for our chicken breasts. We use these thyme leaves in multiple products but especially for seasoning soups and stews. Nice, strong aroma when opening the container. Tastes like just harvested. Color and texture are perfect. I love all the regal spices and the prices are great! Cheaper than my local warehouse store! The dried thyme is great quality and fresh! Thyme is poultrys best friend. I love using it in my chicken soups or chicken pot pie and on my turkey at thanksgiving. So yummy! A really nice quality spice from a great brand. It is very pungent and flavorful and goes great in a variety of dishes. I love the large container with great handle for easy handling. Thyme is awesome on grilled chicken. A nice bulk container of thyme leaves that are fresh and aromatic. A great herb to use on meat especially chicken and fish. it really tastes great. One of my favorite spices is so costly at my local store, that's if you can find it on the shelf. So happy that I can buy it in bulk at a very reasonable price! And all spices are of excellent quality. These Regal thyme leaves are a great buy for the quantity. i use these often in vegetable dishes and on chicken. I love the flavor and freshness of the Regal products. We love the earthy and flavorful punch thyme adds to our dishes. We use it a lot to season our blackened trout. The thyme leaves are very fresh and save us a lot of prep work having to wash and chop our own. I can't say enough great things about the use of thyme in any recipe. Especially chicken. It had a nice almost citrusy and earthy flavor to anything you put it in. This is a great value. Looking to save a little bit of money buy in bulk. The container is resalable to hold the thyme leaves fresh and the opening is large to put a scoop in and refill a smaller container. Thyme is a must have spice in my kitchen. I make a lot of chicken dishes and use thyme in almost every one. It's especially good in chicken soup. Love the size of these spice containers for stocking. Great product, unbeatable price & fast shipping. A must to complete your spice line up, great for lots of recipes. We use these thyme leaves in many of our dishes as well as in our soup! Adds a great extra boost of flavor! Great bang for your buck and the container is perfect for keeping your kitchen organized. Looks nice as a garnish as well. Great line of products at a fraction of the cost of name-brand spices available through our suppliers! These consistently great spices from Regal are highly recommended! Full of flavor, these thyme leaves are great for so many uses. I enjoy using them in dry rubs when smoking various meats. They add an extra dimension and unique taste, when used appropriately. This is good. It is especially tasty when paired with rosemary. You will need this amount of both if you combine them and bake on chicken or tofu because you and your guest will want more and more. Another great find. I use thyme fresh when available but it's difficult to pull all of the tiny leaves off the stem. The dried thyme leaves complement my home made chicken noodle soup, stuffing, and Italian recipes as well. Comes in a clear airtight container with a large handle and stores well in my pantry. Great product and value will continue to order this product in bulk. We use this in our batch recipes five times a week and for a fraction of the cost compared to food service providers, and no loss in quality. I don't particularly like using dried thyme. I prefer fresh as it's taste much better. This one is close enough to the fresh one. I will order again. This is really a terrific item this 5lb Regal Poppy seed. The Price really can't be beat and you are getting a good quality product. We will buy this item again. GREAT PRODUCT! We love the Regal Thyme Leaves. It is a MUST in our kitchen! It is great in dressings, in marinades for summer and also a nice addition to soups! We LOVE IT! 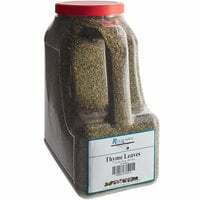 This is another great product i keep the larger container on hand for when I put together one of our house spice blends and I know we will have enough on hand. Regal Thyme Leaves have a great flavor and mix well in our marinades as well as our dry seasoning blends. Great price for the amount purchased, highly recommend. The Regal Thyme Leaves are fantastic! The container is perfect for storage and keeps the leaves fresh after opening. These thyme leaves have excellent flavor and smell. If you use a lot of thyme in your cooking, this is the size to buy. We will be ordering this again!